 This is the second of two parts. 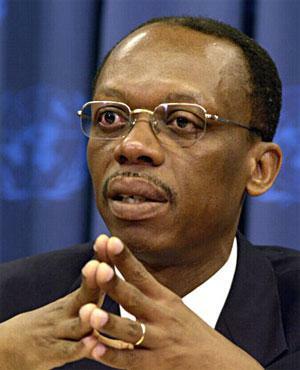 Shortly after Jean-Bertrand Aristide was ousted as president in 2004, Haiti's interim government announced with fanfare that it would get to the bottom of alleged corruption in his administration. And for a while, it looked as though it would. Four blistering reports from two government investigative commissions alleged that Aristide embezzled more than $20 million of his country's meager public funds for the benefit of his private charities, his political party and several private firms that existed only on paper. But two years later, the investigations have stalled, mired in Haiti's dysfunctional legal system, polarized politics, and uncertainty over the willingness of newly elected President René Préval to pursue the case against his one-time mentor. Aristide also is under investigation by a federal grand jury in Miami, which has been reviewing allegations of ties to narco-traffickers, U.S. law enforcement officials say. The U.S. probe -- sparked by the rampant flow of cocaine through Haiti -- has resulted in 22 convictions of Haitian smugglers, ex-police officers and others. But the legal wrangling in Haiti has turned so chaotic that the top corruption investigator, Jean-Yves Nol, was himself jailed for six days in May, accused of illegally trying to block a judge's order releasing about $8 million from bank accounts of the charitable Aristide Foundation and other foundation-related accounts that had been frozen by investigators. The money was eventually released, Nol said. Investigative Judge Jean Ostrict Hercules, who signed the release order and is the head a three-judge panel in charge of deciding whether to pursue criminal charges against Aristide based on the investigative reports, told The Miami Herald that such funds cannot be frozen indefinitely. Hercules refused to discuss the merits of the reports alleging Aristide embezzlements, saying only that his panel has been unable to move the investigation forward because it has yet to receive approval from an administrative board that must first rule that public funds have been mishandled. Separately, the hope of pursuing Aristide through a civil lawsuit filed in Miami last November also appears to be waning. The suit, based on two of the most damning investigative reports, has not led to any concrete actions. Lawyers for the Haitian government have asked for more time, arguing that they have been unable to serve a summons on Aristide because he is in exile in South Africa. Former interim Prime Minister Gérard Latortue says the real cause of the delay has been a fight over money with the Chicago law firm handling the lawsuit. The firm, Winston & Strawn, did not reply to requests for comment. Préval told The Miami Herald last week that he has asked top officials to ''look into'' the suit and the investigative reports on Aristide. But the probes' future will depend largely on Préval. In Haiti's highly politicized legal system, he will have a strong voice on whether the allegations will be pursued or allowed to wither away. Préval, under pressure from Aristide allies and foes, has not said what he plans to do. From the day the U.S.-backed interim government was installed after Aristide's ouster in 2004 amid a violent rebellion, it has insisted that proving Aristide embezzled public funds was its priority. It created two commissions -- Nol's Central Unit for Economic and Financial Investigations, known as UCREF for its French acronym, and the Administrative Investigative Commission -- to probe Aristide's handling of funds back to 2001, the start of his second term. All government agencies, the Central Bank and the state-owned telecommunications company, Teleco, were ordered to audit their books. Latortue at one point even demanded that a warrant be issued for Aristide's arrest. No such warrant was ever issued. And after four reports to Hercules' three-judge panel -- two by each of the commissions -- not one person has testified before Hercules' panel. Haitian investigative judges act like U.S. grand juries, reviewing investigators' reports and deciding whether to file charges. Dorleans defended the interim government's role in the Aristide case and blamed the lack of progress on the absence of a ruling by the administrative board known as the Superior Court of Auditors and Administrative Disputes. The board, whose 10 members were appointed by Aristide, began only in February to consider whether public funds were mishandled. Board President Julien Simon told The Miami Herald that his agency received the four reports only in December, and has been unable to find financial documents substantiating the allegations. Haitian investigators argue that because of the lack of documents, they need to question people linked to some of the allegations. But they cannot do so without an order from Hercules' panel. The reports by UCREF base its allegation of embezzlement and money laundering on the elaborate movement of public funds -- funneled to three paper companies and four humanitarian organizations and then swished among them to make the origin and destination of the money difficult to trace. The investigators reported that of the $21 million diverted from government accounts, about $2.4 million went directly to charities tied to Aristide and his Lavalas Family political party -- allowing him to take credit for humanitarian works and strengthening his image as a champion of the poor. ''The judges have been dragging their feet by not going further with the findings of the UCREF and Administrative Investigative Commission reports,'' said former interim Justice Minister Bernard Gousse, who oversaw the investigations before he was forced to resign last summer amid complaints that he was too focused on prosecuting Aristide. Related text: Putting former Haitian murderous dictator Aristide in tight handcuffs and chains, whose job is that?